Photo courtesy of Bill Hoban, Sonoma Index-Tribune. It’s 3 a.m., early Friday, in the library at Sonoma Valley High School, five days after the fires broke out on October 9th. I notice an evacuee trying, more like struggling, to sit up on her cot, and I walk over and offer to help. Susan* uses a walker and the American Red Cross cots at the shelter are not forgiving to anyone with disabilities. It is hard for her to move. The few nurses volunteering that night are elsewhere. I’m not a nurse but with no one else around to help, I take both of her hands and steady myself against the bookshelf. “On the count of three”, I say, “I’ll help you get up”. One, two, three. Susan is fragile, old. She holds onto my left arm with both of her hands, as I reach for her walker with my right arm. I help her walk over to the bathroom on the other side of the library. We walk quietly, not to disturb all of the other fragile and old sleeping evacuees, all laying on those unforgiving American Red Cross cots. If you had to evacuate your house, where would you go? If you lived alone and were not very mobile, who would help you get out? How do you think you would feel if your answers to those questions were “I don’t know” and “no one”? The fires that struck Northern California in early October brought up a lot of conversations around long-term damages and ramifications: an exacerbated housing crisis, immense loss of jobs, immigration, a distinct polarity between those who can afford to rebuild and those who can’t. I want to talk about our seniors, those whose only option was an American Red Cross cot at a crowded and stressful evacuation shelter, if they got out at all. More than forty people have died in the fires and with over fifty people still missing, that number will rise. While the search for remains in the ashes continues, one thing is confirmed: the vast majority who’ve been identified were over the age of 65. When fires move at an acre a minute, like they did Monday morning on the 9th in Santa Rosa, seniors who can’t move fast enough to get out of their homes will find themselves trapped. Even without mobility issues, Marianne McBride, the CEO of the Council on Aging in Sonoma County, says that 25% of us will lose our ability to drive in our lifetime, sense of smell is one of the first things that goes when we get older, and nearly two-thirds of adults over the age of 70 have some degree of hearing loss. Between not having access to a car to escape, not smelling the smoke encroaching, and not hearing the banging on the doors because we took our hearing aids out, it’s fair to say that we would be stranded. But Susan got out. And the only place she could go was the shelter at Sonoma Valley High. We could say that, on the one hand, Susan, like the other evacuees sleeping next to her, was lucky to have a place to go. On the other hand, it could be seen as a clear example of the state of our seniors in our culture: alone, far away from family, and with such limited resources, unable to afford a hotel the next county over to breathe fresher air. This is not unique to wildfires. One of the most heart-wrenching photos from Harvey’s destruction in Texas in August showed nursing home residents wading in waist-deep floodwater, unable to move. Just weeks later, in the sweltering Florida heat, the Rehabilitation Center at Hollywood Hills failed to evacuate residents when their air conditioning broke down following Hurricane Irma, killing twelve residents between the ages of 57 and 99. It took nearly a hundred volunteers ten days to canvass and provide supplies and care for every floor of Las Teresas—a two-building, multi-story senior living community in San Juan—in the wake of Hurricane Maria. As climate change continues to make these natural disasters more commonplace, we need to ask ourselves what we are doing to ensure the safety and health of our seniors in times of crisis. Based on what we saw this summer, from hurricanes to fires, it is clear that we must do better. We must innovate more inclusive community warning systems (or scale tried and true ones), come up with more efficient transportation plans, provide more comfortable and familiar shelter locations, recognize the importance of community volunteers, referred to as emergent groups, train them appropriately and organize them effectively for emergency response. I did the best I could with Susan, but she needed someone with more training. Susan is home now. Her home was unscathed by the fires. In total, she spent five nights at the shelter on that same unforgiving cot and breathing that smoky air in a room full of other people. I wonder how she is feeling and what she thinks about her time there. I wonder if she has any family and friends who are calling to ask her. If I’d had the chance, I would ask her what we could have done differently and better in that situation. We would be remiss not to listen to her. *Editor’s Note: Name changed for anonymity. 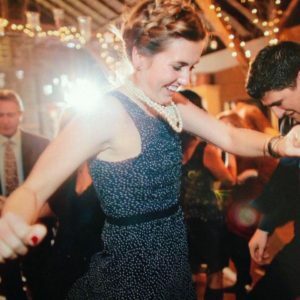 Molly Curley O’Brien is a 2019 MPP/MBA Candidate at the Lorry I. Lokey Graduate School of Business and Public Policy. While her academic focus is the intersection of education, workforce development, and strategic partnerships, her time volunteering during the fires at Sonoma Valley High School, the high school she attended growing up, is solidifying the importance and priority of efficient emergency management systems. Molly, thank you for so many gifts you have shared; your time, commitment, compassion and your ability to bring up some very important concerns. Safety and access to assistance in times of emergencies is becoming more and more important. Best wishes to you in your pursuit! Molly Curley OBrien. Thank you for all you have done to help wherever you could with the fire situation. You are Amazing! Beautifully written article and this is true… my thoughts also. Where does the elderly go? What can we do.